How Far is Sri Sarrnga Nagar? 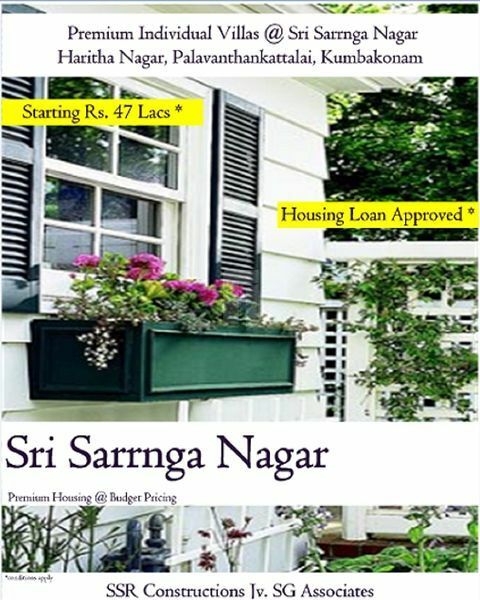 Sri Sarrnga Nagar is a Premium residential project developed by SSRC JV SG Associates at Haritha Nagar, Palavanthankattalai, Kumbakonam, Tanjore Dist. Tamil Nadu. The project offers well designed 2 & 3 BHK houses and is located just besides Palavanthankattalai Panchayat Office in Kumbakonam - Thirunageswaram Main road. . The site is a posh locality and well connected by various modes of transportation and near civic utilities and temples. Kumbakonam Railway station and Kumbakonam Bus Stand are just 2 Kms away from this beautiful location. The site is very close to Sacred Heart Hospital, CITI UNION BANK in Kumbakonam- Thirunaageswaram Main road.